We’re used to hearing how elephants are driven off by habitat lost, but never the other way around. Researchers at University of Florida claim that as overhunting has dramatically cut the number of elephants in the wild, but since these also disperse seeds, it seems like dominant tree species are also dying off. Along with the trees, other forest life is sure to follow in a dramatic cascading effect. Elephants and trees, what’s the connection? In a first of its kind study, Caughlin and colleagues spent three years gathering tree data in Thailand. 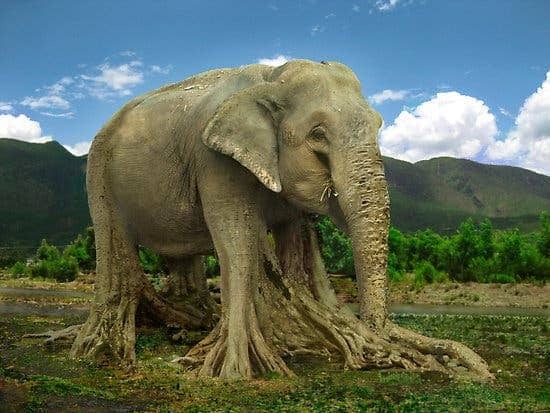 The researchers focused their study on trees that either grew in crowded environments around a parent tree or those that sprouted far away from the parent and whose seeds were broadcasted by animals; like elephants. In Thailand, as in other neighboring countries, the elephant is revered as an important spiritual, cultural and national symbol. Despite this, elephants in Thailand today only number 2,000, a dramatic fall from the over 100,000 that could be found at the turn of the 20th century. Hunting and poaching are to blame, spurred by increase demand for ivory. The same fate seems to dwell on other animals such as tigers, monkeys and civet cats. Using the data they gathered in Thailand, in conjunction with a dataset from the Thai Royal Forest Department that contained more than 15 years of data on trees, the team performed a simulation on UF’s supercomputer, HiPerGator. The long-term rundown shows that trees that grow from seeds transported over long distances by animals are sturdier and live longer. This was the first study that documented animal seed dispersal across a tree’s entire life cycle, from seeds, to seedlings to adult trees. Hopefully, the findings will provide an additional much needed incentive for local authorities to stiffen measures against overhunting and animal trading. Richard Corlett, director of the Center for Integrative Conservation at the Xishuangbanna Tropical Botanical Gardens in Yunnan, China, underscored the study’s importance. Findings appeared in the journal Proceedings of the Royal Society B.